So have you realized that you are buried under a pile of stress and need help digging out? There are a variety of stress management techniques available to help you. Stress management and stress reduction techniques can include seeing different types of life coaches. Stress relief depends on mental health, but many people find that using exercise can be a great reliever of pent up anxiety and energy. If you have dreams of succeeding in business and in your personal life, you need to maintain a healthy lifestyle and keep your mind clear and ready for action! Working with a coach focused on clearing your mind in order to succeed in your career can do wonders for your stress levels. Some people suffering from stress and panic attacks turn to spirituality coaches for guidance with zen meditation, transcendental meditation, and other deep thinking or relaxation techniques. A 5-year study is currently evaluating whether stress management can ease mental health distress and physical symptoms in breast cancer patients. Researchers are testing whether tai chi training and spiritual-growth groups reduce stress and enhance coping strategies. Tai chi is described as meditation in motion that focuses on slow, graceful movements to increase strength and flexibility and to improve balance and circulation. Spiritual coaches allow people to express emotions and discuss pain and stress in a supportive environment. Both approaches should normalize levels of stress-related hormones like cortisol and endorphins by allowing expression of feeling and emotion and the focus and inner balance afforded by tai chi. If you are in a stressful period of your life, try to keep yourself from turning inward. Find a coach that can listen and help you reconnect with your body. So the cards are already stacked against us. Throw in years of yo-yo dieting, daily stressors, and the hormonal and biochemical interactions that stress has on the body, and it’s easy to feel like you’re constantly fighting a losing battle. While stress can’t be eliminated from a person’s life, stress relief can be found in a variety of “mind-body” interventions. Meditation, yoga or even a long walk can go a long way to improving your mind/body relations. Effectively managing your stress is a key component to success in just about everything- from achieving your diet goals to career goals. Stress can overwhelm your mind, deplete your motivation and make you physically unhealthy. Why do you get stressed? How can you relieve it? Here is the scientific skinny on stress and hormones! Levels of the stress hormone, cortisol, increase in response to any psychological or physical stress in the body, such as illness, trauma or temperature extremes. Endorphins are brain chemicals known as neurotransmitters. Stress and pain are among the most common stimulators of endorphin release. Endorphin secretion results in reduced pain perception, feelings of euphoria and increased immune response. So basically, stress puts your body in gear, whether to deal with a trauma and illness or an intense physical activity. 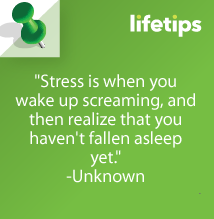 Problems arise when you hold too much stress, too much of the time. Identify the basis of your anxiety. Set achievable goals and watch your stress level diminish. Do not kill yourself over a deadline. Unlike actual death, it can be rescheduled. Scheduling unrealistic deadlines leads to disappointment, and disappointment can cause you to give up or miss opportunities. When you’re overwhelmed, self doubt can undermine you. Use your time wisely. Set up a system that works for you so that you don’t constantly feel bad that you didn’t accomplish your goal. Making progress will fuel your passion and turn you on to more opportunities. Unrealistic deadlines do not allow you to build confidence. Setting attainable goals helps you to gain confidence each time you accomplish one of your goals. With your newfound confidence you can set and achieve more difficult goals. Conversely, if you repeatedly miss deadlines you will lose confidence and begin to doubt yourself. If you’re beginning to have self doubt about your ability to get things done, maybe it’s because you think, “It’s easier to do it myself.” Only you have what it takes to get things done, but you don’t have the time, so nothing gets done. That’s a poor strategy for success, so get help. Identify the resources and opportunities available and use them. The single most powerful thing you can do to make your dream come true is share your dream with someone who is on your side. Hiring a life coach can also help you to achieve your goals. A life coach can work with you to assess your current lifestyle and make suggestions for changes that could help you achieve your goals. A life coach can work with you to formulate a strategy for achieving your goals. How can you motivate yourself to achieve your dream? Well, you’re not going to live forever. That’s motivation! If you had eternity to accomplish your goals, you wouldn’t feel the need to push yourself, to chase your dreams. So consider your impending doom a gift, and seize the day. The majority of people with goals don’t apply the action needed to bring them to fruition. Their ambitions and hopes stay locked up in their minds, like Rapunzel in her tower, waiting for someone to let them out. Be your own knight in shining armor. Let your ambitions out. Setting goals can inspire motivation. Once you actually set a goal, you’ll feel an immediate obligation to achieve that goal. This motivation pushes you to succeed. Daily words of encouragement will help. Whether you’re reading motivational quotes, inspirational stories, or just getting motivational sayings from loved ones, a little encouragement can change the way you look at life. Some people also benefit from mentors as a motivational resource. A mentor teaches you the ropes of a given career or even a way of life. Mentors provide advice, information, encouragement and above all accountability. If you won’t be accountable to yourself, get a mentor. Procrastination- in theory- is supposed to make our lives more pleasant. In reality it almost always adds stress, disorganization and failure. Procrastination is based on fears. In varying degrees, we are all afraid of facing reality: life’s challenges, the hard work and frustrations ahead of us. Negative reinforcement plays a major role in procrastination and hinders success. Behaviors like watching TV and rationalizations or excuses enable the procrastinator to avoid unpleasant work. Procrastination is an escape. The procrastinator must correctly identify his forms of procrastination and find solutions for his specific emotional reactions in order to kick the habit. These now infamous words spoken by Richard Sherman after winning the game that sent the Seattle Seahawks to the Super Bowl were spoken at precisely the wrong time. Live, on camera, to Erin Andrews. Yes and no. It is that very intensity, passion and emotion that make him the player he is on the field. Unfortunately he unleashed it off the field. What did his coach, Pete Carroll have to say about this in his interview with ESPN? Defense, protection and forgiveness. Being a coach is about more than getting the best out of your players and clients- it’s about understanding who each one of them is. Carroll’s coaching technique is one that can be applied to all relationships. One of forgiveness, understanding and hard work. So while the media frenzy focuses on Sherman’s aggressiveness, I think the truly remarkable story is about Carroll’s perspective, coaching genius and level headed coolness. Seahawks fan or not, there’s a coach we can all look up to. Follow your heart and act on something that you know to be true for you. Demonstrate that you are committed to at least exploring your dream and prove to yourself that it’s important by taking action. The saying “action speaks louder than words” never rang so true. Living powerfully includes being authentic and compassionate. Live large yet genuine. Trade the mundane for the unexpected. Play! Do you remember the sound of your deepest belly laugh? Recognize what makes you happy and bring more of what you love into your daily life. Rekindle your sense of humor and do things that not only make you smile, but that make you giggle. Extra credit is awarded for making someone else laugh. Happiness brings confidence and with confidence you have the power to achieve your dreams. Don’t worry about offending others (or your own sensibilities) with some bold dreams and some bold moves to achieve those dreams. Make a plan, and then do whatever it takes to get there. Surround yourself with a positive support system. When things get rough it’s integral to have positive people around to tell you to keep going. For a creature that is so good at acting like a typical bear on land, the polar bear is surprisingly great at acting like a fish in the water as well. Polar bears are very strong swimmers and have been spotted swimming as far as 200 miles from land. They use a “doggie paddle” approach to propel themselves through the icy waters of the Arctic Circle. With the use of their huge paws, polar bears can swim up to 6 mph. To put this speed in perspective, Michael Phelps’s fastest time is 6 mph. So if you’re not Michael Phelps, you cannot win in a swimming race against a polar bear. And if you are Michael Phelps, you will probably tie the polar bear, even on your best day. Also good to note: while polar bears prefer to hunt on land, they are also capable of doing it in the water. So to sum up, if you don’t like losing races to huge marine mammals, and/or you don’t like being hunted in the water, don’t swim with polar bears. …Go barefoot! 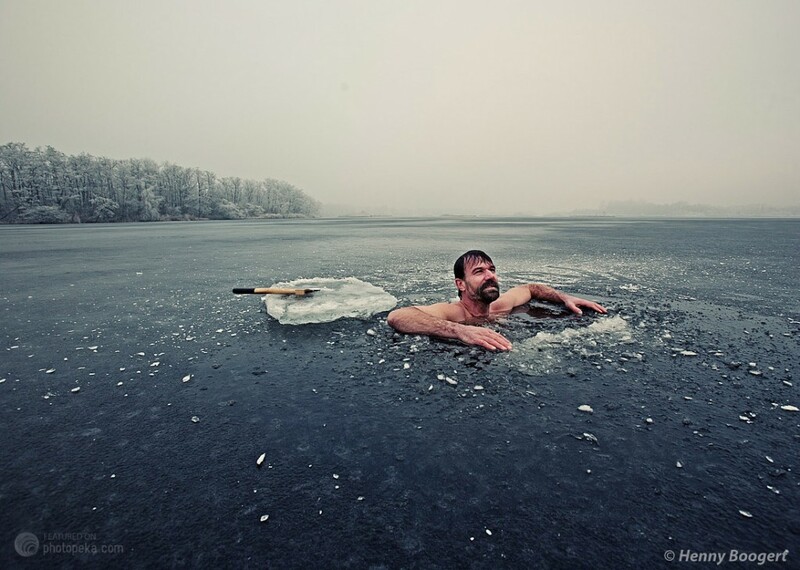 At least that’s what Wim Hof aka The Iceman would do. Hof is a Dutch marathoner, adventurer and all around daredevil known for his ability to withstand extreme cold. Most notably, in 2009, at the age of 50, Hof completed a marathon (26.2 miles) in Finland above the Arctic Circle wearing nothing but shorts. Yup, no shoes, no shirt, no problem. The temperature was -4 degrees Fahrenheit. His time was 5 hours and 25 minutes. And his legacy was secured in the record books. Hof accomplishes surviving in temperatures that would be fatal to a normal human by controlling his own autonomic nervous system and immune system through meditation. In addition to the aforementioned marathon, Hof also ran a full marathon in the Namib Desert without water, and holds 20 world records including one for the longest ice bath. Still, Hof insists that he is no superman, and that everybody’s mind is capable of doing what his does. LifeTips is the place millions of readers go for tips and advice to make life better, and more fun. Our writers are so great–they're Gurus! And they keep the tips, advice and books flowing to readers, fans and listeners of our podcasts and weekly radio show. © 2015 LifeTips — All rights reserved.